Question papers from ZIO-2014, ZCO-2014 and INOI-2014. We thank all the organizations that have supported the Indian Computing Olympiad in 2014. 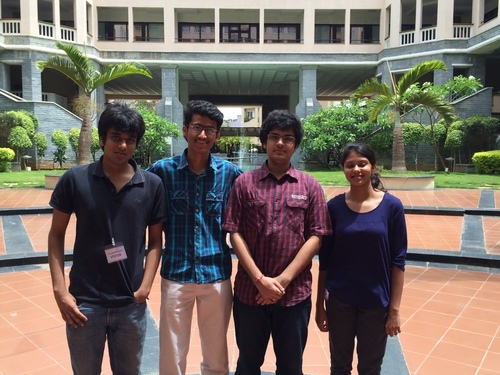 Sasken Communication Technologies Ltd sponsored the 9 day training camp from 1–9 May, 2014 in Bangalore to choose the final team and also provided full financial support for the team's trip to IOI-2014. The International School Bangalore made their congenial campus available to us for holding the training camp in May. IOI-2014 was held at Taipei, Taiwan during July 13–20, 2014. Akshat Bubna won India's first ever gold medal at IOI, while Malvika Raj Joshi won a silver medal. Pushkar Mishra narrowly missed winning a bronze medal. The Leader and Deputy Leader of the Indian contingent were Prof K Narayan Kumar, Chennai Mathematical Institute, Chennai, and Nadeem Moidu, Google, respectively. INOI-2014 was held on Sunday, 19 January, 2014. Of the 252 students who participated in INOI-2014, 26 students have qualified for the training camp to select the Indian team for the International Olympiad in Informatics, 2014 (IOI-2014). ZCO-2014, Saturday, November 30, 2013. The Zonal Computing Olympiad, 2014 (ZCO-2014) was held on Saturday, 30 November, 2013. About 100 students wrote ZCO-2014. 40 students have qualified for the Indian National Olympiad in Informatics, 2014 (INOI-2014). The Zonal Informatics Olympiad, 2014 (ZIO-2014) was held at 39 centres in India and West Asia on Saturday, 23 November, 2013. About 7300 students wrote ZIO-2014. 275 students have qualified for the Indian National Olympiad in Informatics, 2014 (INOI-2014). Testdata for Problem 1, Highway Bypass. Testdata for Problem 2, Free Ticket.